The next-generation Barak surface-to-air missile (SAM) system, jointly developed by Israeli Aerospace Industries, Rafael and DRDO, was successfully tested for the first time from an Israeli warship against a jet-powered drone on Thursday. The supersonic Barak-8 missile system, whose interception range has been increased from the earlier 70-km to around 100-km, will be now tested from Indian destroyer INS Kolkata "within a month", said sources. Once the long-range SAM system is fully operational in around two years, all Indian frontline warships will be equipped with this all-weather "defence shield" against incoming enemy fighters, drones, helicopters, missiles and other munitions. "It will be the standard LR-SAM or area defence weapon for our warships, much like the 290-km BrahMos supersonic cruise missiles (developed jointly with Russia) have become the standard precision strike weapon on them. PSU Bharat Dynamics is already gearing up for producing the LR-SAM systems in bulk," said an official. The Rs 2,606 crore LR-SAM development project was sanctioned for Indian warships in December 2005 but was hit by several delays. The reasons ranged from mid-way upward revision of performance requirements and development of some new technologies to the technological challenge of "combustion instability of rocket motors" that took a long time to resolve. The delays led to the commissioning of the new 7,000-tonne destroyers INS Kolkata and INS Kochi over the last one year without effective missile defence shields. Even the country's largest and most powerful warship, the 45,400-tonne aircraft carrier INS Vikramaditya acquired from Russia for $2.33 billion, faced the same fate. The Navy then cannibalized an Israeli Barak-I anti-missile system for the carrier from the retiring frigate INS Godavari. Fourteen Indian warships, including aircraft carrier INS Viraat, are currently equipped with the Barak-I system, "a point defence weapon" with an interception range of just 9-km, acquired from Israel after the 1999 Kargil conflict. The new LR-SAM system with Barak-8 interceptor missiles, which have "active seekers" for terminal guidance, is a much more advanced version with extended interception range. "INS Kolkata is already equipped with the missile launchers, weapon control systems with data links and MF-STAR (multi-function surveillance and threat alert radar) of the LR-SAM," said the official. All frontline operational as well as under-construction warships, like the 40,000-tonne indigenous aircraft carrier INS Vikrant, five destroyers and seven stealth frigates, will progressively be fitted with the Barak-8 systems. 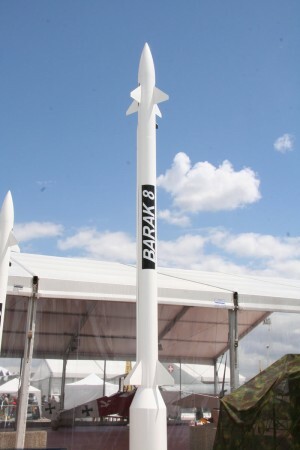 Similarly, the ground-based version of Barak-8, which was sanctioned in February 2009 for Rs 10,076 crore, will be utilized by the IAF to plug the existing gaps in air defence coverage of the country. Right now all our new frontline warships are without long range surface to air missile , and are practically defenceless against air threats . When the Barak 8 missile is finally developed , we may get real defence against air threat to our new frontline warships . That may still take couple of years .